You Gotta be Fit to be Fast! As a Laser sailor competing on the ISAF Sailing World Cup circuit, I see what it takes to truly become a world-class athlete. Competing at the top level, in any class, requires countless hours of practice and preparation. Spending a lot of time on the water before heading to a regatta will certainly help you move up in the fleet. Being prepared and organized can reduce unnecessary breakdowns. Outfitting your boat with the best gear and new sails can help you move up a couple more. Physical fitness can mean the difference between a podium finish and a mediocre regatta. Beyond being able to hike harder and longer, sailing fit will help you make better decisions. When we are tired, it can be easy to lose focus of the big picture during a race. This could be anything from spotting wind shifts to positioning yourself in the fleet or rounding the favored gate mark. The first step in taking sailing to the next level is to start, or build onto, a training plan. Consulting a trainer who knows sailing is the best way to get on a program that works for you. A structured regimen has been very helpful for my fitness training. Having a plan when I get into the gym allows me to focus on the exercises themselves, and not what I need to work on next. A plan will guarantee that you are working toward your goals and makes it easy to see yourself progress. Setting goals certainly helps me stay on task. Taking the time to set reasonable goals, and even sharing them with coaches and friends, will give you the greatest chance of reaching them. The more people you have following and helping to push you, the better. As a member of the US Sailing Team Alpha- Graphics, I am fortunate to have help from a talented support staff. From nutritionists to physical trainers, there is always someone there to help with any aspect of training. A few times each year, the entire team will meet for an event or training camp. Most recently was a camp at the U.S. Olympic Training Center in Colorado Springs, CO. There, we can exchange training information and learn what has been working for other teammates as well as encourage each other to reach our goals. Anyone can be in great shape by going to the gym four or five days a week, but being in sailing shape is what’s important. The muscle groups used on the water are very different from those of a football or tennis player. Most of my time in the gym is spent on core, legs and back. Squats have become a very important part of my routine. This one exercise works all three leg muscle groups and can be easily modified for both endurance and strength building routines. Always consult a trainer and have a spotter when lifting heavy weights, because correct form helps avoid injury. Dumbbell rows are also very popular because they require stabilization from your core and utilize a very similar motion to that used while sailing. 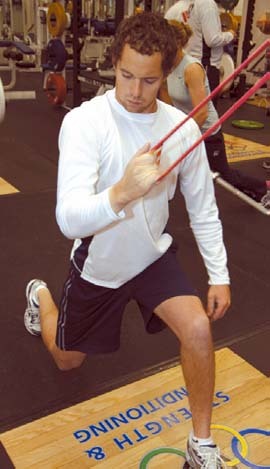 I can remember feeling exhausted at the end of long heavy air days, when certain muscle groups just could not keep up. Once I learned to exercise smarter, it took a lot more to become tired in breezy conditions, which produced better results. The best advice I can give is to be creative with your workouts – and work hard. Nothing beats time in the boat, but carefully choosing exercises to complement your sailing can turn any gym workout into the equivalent of a day of heavy air racing. Most difficult of all is maintaining the drive to get faster and stronger. Even after getting a gym membership, putting in hours of hard work and spending time and money to achieve the perfect workout, it can still be tempting to cheat on your training plan. Working out with a training partner can be a good way to stay on schedule and focused (as long as they have no problem calling you out for being lazy). No excuses! Kyle Rogachenko of Collegeville, PA is a member of Toms River Yacht Club. He is a member of the US Sailing Team AlphaGraphics and hopes to represent the U.S. in the Laser at the 2012 Olympic Regatta in Weymouth, England. 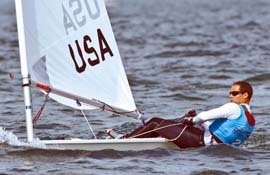 He won the George O’Day Trophy at the U.S. Singlehanded Championship in 2007 and ’09, and will be a senior at Old Dominion University in Norfolk, VA this year. The name that defined the term “racer/cruiser.”. With the high tech construction and racing design she is fast. The beautiful interior makes for pleasurable cruising with berths for six! There is a separate aft cabin and a walk-in shower in the head, To top it off she has air condition. Her sails are new, high tech, and have had light use.